We all know how important it is to keep kids hydrated, especially while they're playing sports or having fun running around outside with their friends, or when they're outside in the summer heat. But what kids drink is as important as how much they drink, especially since there are so many choices for kids today that look deceptively healthy but are not. Many beverages on store shelves today are loaded with added sugar, calories, and even caffeine, and have no nutritional value. Doctors have found that sugar-sweetened drinks are associated with cavities, excess weight gain, and poor diet. And according to a recent study of almost 3,000 middle and high school kids in grades 6 to 12, regular consumption of sports and energy drinks was even found to be linked to higher video game use, greater intake of juice, and sugar-sweetened beverages, and smoking. Many parents may think sports drinks are a healthier option than juice for kids since they contain minerals and electrolytes that can be lost during hard workouts. 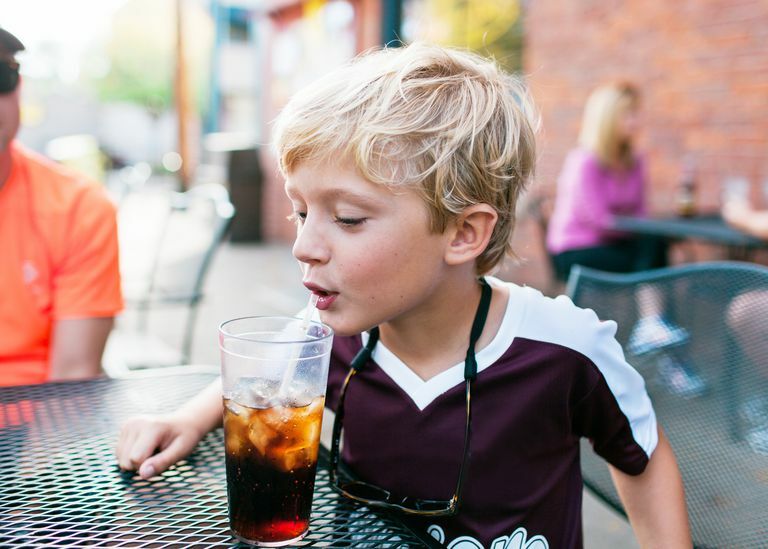 But sports drinks are quite high in calories and sugar, and are not necessary for kids, says Kristi King, a senior dietician at Texas Children's Hospital and a spokesperson for the Academy of Nutrition and Dietetics. More problematically, many parents allow kids to have these drinks even when they haven't exercised vigorously. "Sports drinks were made for the endurance athlete," says King. "Most kids are not physically active enough to need sports drinks." Better option: Give kids water and healthy snacks like string cheese, nuts, or watermelon, and/or oranges, which are both chock-full of electrolytes. Pretzels and dill pickles are also excellent choices to replace the salt lost when kids perspire. These beverages are laden with some pretty undesirable ingredients, including large amounts of sugar and caffeine. They're also very high in calories. "These are all the things we want to avoid giving to kids," says King. "They cause blood sugar spikes and crashes, interfere with sleep, and raise the risk for diabetes and obesity. There is no reason for a child to have energy drinks." Parents know it's important to limit or cut out both sugar-filled and artificially-sweetened soda in kids' diets, but juice is a good option, right? Well, that depends. Many juices are fake juice that's been loaded with lots of sugar and have no nutritional value and lots of empty calories, says King. Sugary juices put kids at risk for obesity and type 2 diabetes. The biggest problem with juices is that they may say "no sugar added" but may actually have high fructose corn syrup, says King. Better options: Stick to 100 percent fruit juice, which has less added sugar and more nutrients. Or keep cold water in the fridge and add fruit such as lemons, orange, or apple slices to flavor the water. You may also want to consider juicing, which continues to be a huge trend. "Juice apples, carrots, bananas, and spinach," says King. To replace soda, try adding a bit of 100 percent fruit juice to seltzer or club soda. Sugary "tea" drinks in a bottle are a far cry from a healthy cup of green tea. Sweet teas are often basically pure sugar, says King. Better options: Instead of bottled sweet teas give kids herbal fruit teas with added fruit like raspberries and honey or maple syrup for a touch of sweetness. A growing trend that's worrying health and nutrition experts is raw milk, says King. "Many people think raw milk is healthier, but it's actually illegal to purchase in a lot of states," says King. That's because when milk and cheese aren't pasteurized, there is an increased risk that it will carry dangerous bacteria such as E. coli and listeria. Kids' immune systems are weaker and more prone to infection, which makes raw milk particularly dangerous for them. Better option: Lowfat pasteurized milk. "Parents should serve mostly low-fat or skim milk at meals and water in between meals to kids ages 2 and over unless their children have special needs," says Nicole Larson, Ph.D., lead author of the study on adolescent consumption of sports and energy drinks and their association with unhealthy behaviors. Shockingly, some kids – particularly adolescent and teenage girls – are drinking herbal supplement beverages as a weight loss supplement, says King. But because these drinks are not regulated by the U.S. Food and Drug Administration (FDA), they can be very dangerous. "What's on the label is not necessarily what's in the bottle," says King. Many popular coffee drinks are very high in sugar and caffeine, says King. When kids consume these beverages, which are meant for adults, it can affect their sleep patterns and their ability to concentrate. Kids can become hyper. "Children are affected differently," says King. "They are not mini adults." To make sure kids are drinking healthy beverages, do your best to substitute water, milk, and other no- or low-sugar drinks for the unhealthy ones on this list. And know what your kids are drinking at school or on play dates, at school and with your caregiver or sitter. Train your child's taste buds to like natural and less sugary drinks, and reach for natural sweeteners like fruit to jazz up water. It's a great way to cut down your child's sugar intake, encourage healthy eating habits, and hydrate naturally!